On February 6 the ICSC Government Relations Committee in Maryland held its annual Day at the State Capitol in Annapolis. The committee is chaired by Mickey Papillon, vice president - general manager of Pike & Rose, Federal Realty Investment Trust. The committee highlighted several key legislative issues being considered this session, including e-fairness and marketplace sales tax collection. As a result of the Supreme Court decision on e-fairness, the Maryland Comptroller’s Office approved temporary regulations that went into effect on October 1, 2018 to allow for the state to collect sales and use tax from online retailers who have at least $100,000 in sales and more than 200 transactions in the state. During the lobby day ICSC advocated for those regulations to become permanent and for a law or regulation to require online retailers who meet the above standards to collect and remit sales tax from third party sellers who use their website or marketplace to sell products. In addition, combined reporting proposals that may impact retailers and businesses who operate in multiple states, plus several environmental and transportation priorities were discussed. If you would like to get involved with the Maryland Government Relations Committee or have any legislative/regulatory matters you would like to discuss, please contact ICSC State and Local Government Relations Manager Stephen Burm. 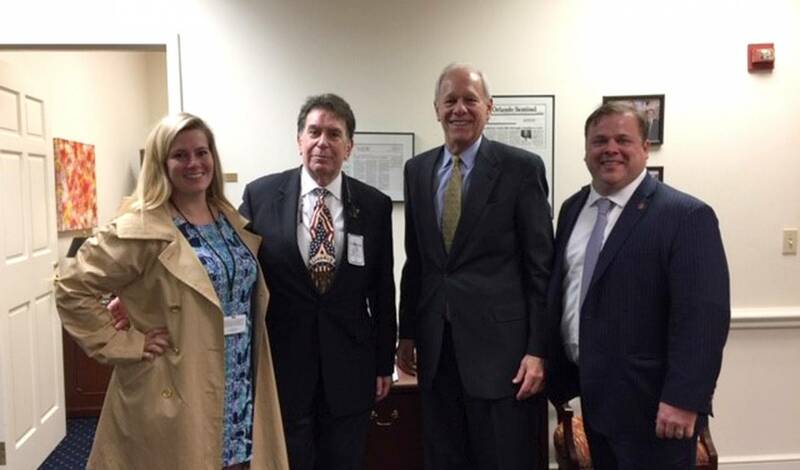 L to r: Shannah Minderlein (Capitol Strategies), Marc “Kap” Kapastin (Quantum Companies), Senator Paul Pinsky (D-District 22) and Stephen Burm (ICSC).